I am realizing as I share some of the activities we do each week in my classroom that I don’t always share some of the items I use on a regular basis. Since TPT has a sale coming up (more on that below) I know bundles are something I tend to purchase during these sales and figure you might like to see some bundles that you can really save on this week. 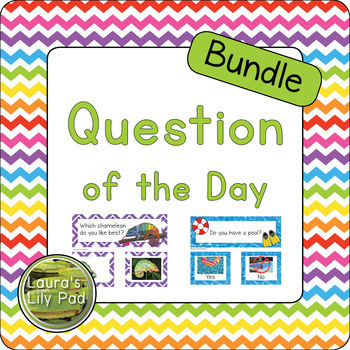 My Question of the Day Bundle gets used daily in my classroom. For example, this week I am using some Valentine and friendship questions. I place my questions on a pocket chart near entrance to the classroom with student name cards placed nearby for students to choose their own name and respond to the question. You can see the pocket chart (referral link) I use below. 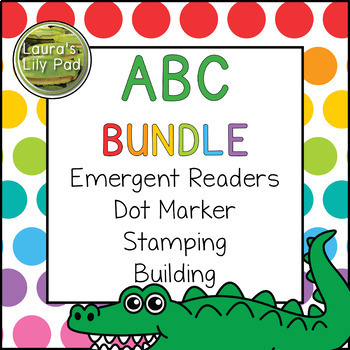 I also use several of the items in my Alphabet Bundle weekly. I do not use each part every week, but rotate through them for variety. I do use the alphabet emergent readers each week that I am reviewing an alphabet letter, rotating through whether we will be cutting and pasting or coloring in our books. My students really enjoy dot markers, so I use them often in different ways. Below you can see an example of the alphabet letter search included in the ABC Bundle. My students also enjoy stamping as part of the writing center this year, so I rotate stamps in with my Stamp and Write pages from my ABC Bundle. Letter stamps are from Melissa & Doug (referral link). I wrote the letter name on the side of the stamps as well because they will not stay standing up and give enough space for little hands to grab them. My students also enjoy building so I rotate my linking cubes and triangles (referral link) into my room every so often and add the alphabet building cards from the ABC Bundle. If you have ideas for theme pictures sets for the cubes and triangles, please let me know. This is definitely on my list of ideas to work on making more cards for since my students enjoy them. 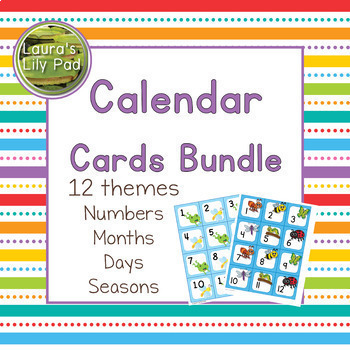 The other bundle that I use all the time in my classroom is my Calendar Bundle. Right now I have the Nursery Rhymes cards in my calendar and will probably move on to the Spring set next. My students love guessing the pattern each month. So now, on to the special announcements. Teachers Pay Teachers is having a sale on February 14 and 15. Using the code XOXO, you can get up to 25% off items in participating shops. All of the items in my shop will be discounted the additional 25% off. This means these bundles will be super deals. Finally, I have a $10 Teachers Pay Teachers gift card to give away. To enter, follow the instructions below. Giveaway begins at at 12:00am February 13 and ends at 12:00am February 14. I will contact you Wednesday morning so that you can get your gift card in time to use it during the sale.